This textbook introduces the readers to SOLIDWORKS 2018, the world's leading parametric solid modeling package. 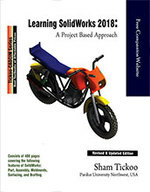 In this textbook, the author has adopted a project-based approach to explain the fundamental concepts of SOLIDWORKS. This unique approach has been used to explain the creation of parts, assemblies, and drawings of a real-world model. The textbook will provide the users a sound and practical knowledge of the software while creating a motor cycle as the real-world model. This knowledge will guide the users to create their own projects in an easy and effective manner. Keeping in view the requirement of the users, a single project has been divided into many chapters to make the users understand the concepts in a better way. The creation of each part, assembly, and drawing has been explained using small steps which make the learning process quite simple and effective. Additionally, the tools introduced for the first time have been dealt with in detail, so that you can gain expertise and proficiency in SOLIDWORKS. After reading the textbook, the user will be able to create parts, assemblies, drawing views with bill of materials, and also learn the techniques that are essential for designing multiple models of similar geometry with ease. Project-based book consisting of 12 chapters that are organized in a pedagogical sequence. Self-Evaluation Tests and Review Questions at the end of the chapters for the users to assess their knowledge.